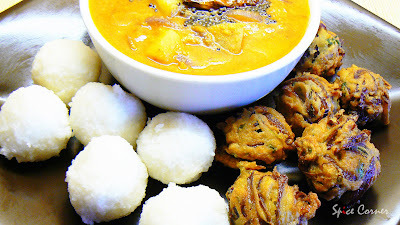 In today’s menu I am going to present authentic, traditional Mangalorean recipe of Akki Pundi (Rice Dumplings). This was the first time I tried making this and boy! They were so simple and easy to cook. There is no frying, rolling and no sweating or swearing ;) Everything went so smoothly and I really-really managed to produce perfect Pundis. Thanks to my MIL who gave me simple yet best recipe to make perfect Akki Pundis. I served them with delicious bowl of onion-potato Sambar, Rave (pronounced as ra-way) which is made from jaggary and onion pakodas (oh!!! It’s difficult to stay away from fried food :) This time I made Onion Pakoda’s using Asha’s recipe and boy, they were yummylicious :) Thank you Ashakka for yummy recipe. And these pakodas are my entry for Coffee’s MBP. There are different ways of making Akki Pundi’s and this is my MIL’s version. I will post my Amma's version sometime later. Wash rice and spread it on clean cloth to dry. Once all the water is dried up, grind the rice without adding water coarsely. Make sure that you don’t grind it to smooth powdery texture. I usually grind the rice grains to khus-khus sized granules. In a mean while, pour 3 glasses of water and salt to taste in thick bottomed vessel and bring it to boil. As soon as the water is hot enough add ground rice and keep mixing the mixture making sure that they don’t stick to the bottom of the pan. Make small lemon-sized balls by wetting your hands in cold water. Arrange them in a steamer and steam cook for about 15 minutes in medium heat. Let it cool down a bit before you serve them. Serve them with any Sambar, Kurma, Honey or Chutneys. Once you mix the hot water and rice flour you can shift the mixture into microwave bowl and cook it in microwave for about 10 minutes. Make sure that you mix the mixture once in every 3 minutes so that it’s mixed evenly. You can also cook the Pundi’s in microwave for 8-10 minutes using Microwave Idli Maker. To make spicy Pundi’s, season mustard, urad dal, broken red chillies and curry leaves. Add this seasoning to the water along with rice in the beginning and then proceed with the next steps. You can also add ½ cup of freshly gated coconut to the mixture. Loved the gol matol unde(thats what I call them). And as always the pictures are perfect and the onion pakora's oh boy all of them my all time favs. Love them all gal!!! they look so cute. very similar to our upma kozhakattai except the seasoning. 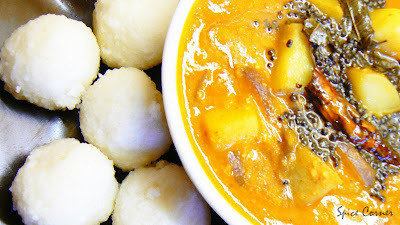 These are looking so cute.Do you eat them dipped in the sambar like we do with idli? The entire dish along with those pakoras looks yummy. Supriya, akki pundi looks delicious...My MIL n' Mom make rice kozhukattai amost the same way.Thanks for sharing. Hi Supriya, Nice recipe. We call them kozhakattas and have them with coconut chutney. 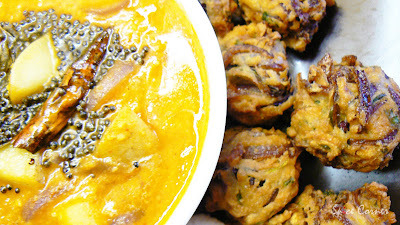 Onion pakoras, wow, mouth watering! Yummy!! I love spicy Indian dishes..seems these preparations are from the southern part of India. Thanx a lot for sharing the recipe, but really dunno how it is gonna finally taste. Thanx a lot for sharing it!! This recipe is new to me though it somewhat sounds like plain kozhukattai.They really look lovely with sambar. Wow! My mom makes them with Akki tharee, I love them very much. This recipe brought back so many memories. Thanks supriya. 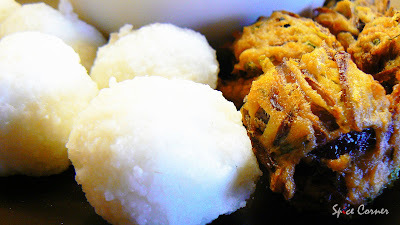 Rice dumplings, onion pakoda I love it. Awesome. thanks sia. Thanks for making and enjoying Pakodas and Akki Pundi or Kadubus look wonderful and I love the color of the sambhar!Pretty Thali. I hadn't heard of akki pundi, Sup. Looks yum! The pakode look really good too! Its a wonderful breakfast menu. Hey..
Konkani's make a similar Pundi..we call it Undi! My method is very different, but I guess end result is almost same. Yummy looking dish Thanks for sharing. 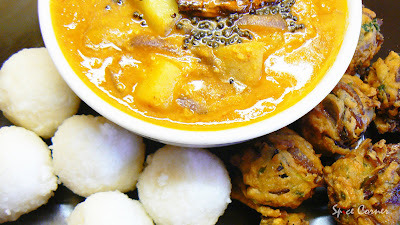 Lovely pics as always and rice dumplings and onion sambhar looks mouth-watering , and its breakfast time here in India , I am Drooling dear ..
mmm... is kozhakattai kerala dish? u can serve them dipped in a bowl of sambar. leave the pundis in sambar for 5 minutes and serve hot... my MIL usually serves it like that but i like to eat it with other side dishes too. so i serve them separately with sambar, chutney and honey. Really cute akki pundi and pakoras look delicious! 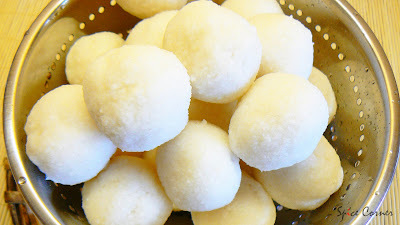 !Our pidi is similar to akki pundi but small balls and serve with beef curry . i spent the new year's of 2003 in Mangalore and all I ate was akki pundi. and your pakoda's look so you. will be back for more. 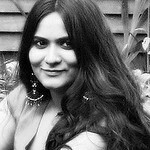 just now i left comment in ur blog and here i see urs:) loved all ur short stories:) looking forward for more interesting stories from u.
is it just my blog u cant access from ur office or others too? your pictures are looking so good, as usual this time too i wishto grab some of it :)) . this is new item for me, thanks for sharing , My net is not working properly since last few days, seems like i missed so many nice entries here, btw, my superhero was spider man :D.
yum yum yum pakoras and yum yum yum akki pundi. What else should I say! no worries girl... hope ur net connection is working fine now. i am eagerly looking forward to ur MIL's recipe vani. is she from mangalore too? Can we use any type of rice for this? you can use any type of rice but it tastes best when made using either idli rice or sona masuri rice or rosematta rice(red rice) which are available at any indian grocery stores. if you don't get any of these rice you can simply use basmati rice. Thanks for your excellent website. Here is a link to how we make them. Sorry my photos are not as presentable as yours. steaming hot pundis with the seasoned red chutney is a feastly tiffin item.. never one can avoid relish this simple though lovable item!! !